The Spacecraft Environmental Anomalies Expert System – Real Time (SEAESRT) is a set of data-driven algorithms that indicate the likelihood of an environment-related anomaly on a geosynchronous satellite. The target customers are operators of geosynchronous satellites who can benefit from guidance on the hazard levels during active space weather conditions to make decisions on the operation of their satellites, as well as to assess the possible causes of anomalies that have occurred. 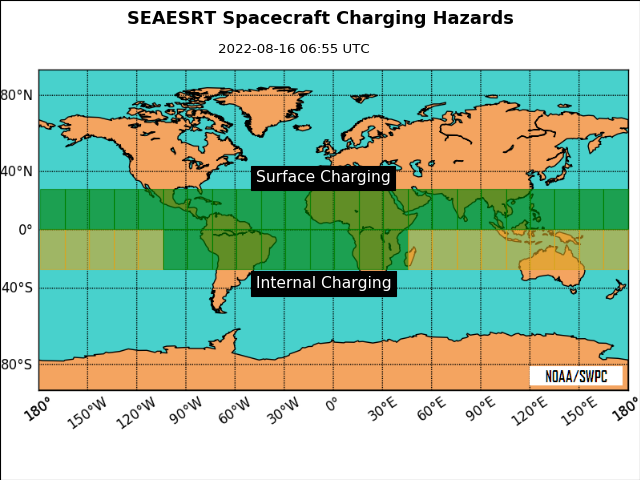 SEAESRT gives hazard levels at geosynchronous orbit for four common types of satellite problems: surface charging, internal charging, single event upsets, and total dose effects. For each of these four hazard types, the software gives a hazard quotient that represents the probability that the current environmental conditions will result in a satellite anomaly, relative to the long-term average likelihood of an anomaly. A hazard quotient of unity indicates the likelihood of an anomaly is equal to the long-term average. All of the hazard quotients are derived from the statistical occurrence of on-orbit anomalies or their proxies. It is assumed that the probability of future anomalies has the same statistical relationship to the environmental conditions as the historical anomalies. O’Brien, T. P. (2009), SEAES-GEO: A spacecraft environmental anomalies expert system for geosynchronous orbit, Space Weather, 7, S09003, doi:10.1029/2009SW000473. Satellite surface charging is caused by low-energy electrons. The surface-charging hazard quotient is derived from the Kp index of geomagnetic activity, which is related to the injection of low-energy plasma into the inner magnetosphere from the magnetotail. Higher values of Kp are correlated with higher levels of low-energy electrons at geostationary orbit and consequently higher occurrence of surface-charging anomalies. The internal-charging hazard quotient is derived from the level of >2 MeV electrons measured by the GOES satellites. High energy electrons can penetrate into electron components, and when sufficient charge builds up, a discharge can occur that may result in an anomaly. The single-event-upset hazard quotient is derived from the >5 MeV and >30 MeV protons measured by the GOES satellites. High energy protons can penetrate into electronic components and directly disrupt computer memory and processes that result in system anomalies. The total-dose hazard quotient is derived from the >5 MeV protons measured by the GOES satellites. This hazard quotient was defined to apply to the hazard to solar power arrays due to short-lived enhancements in the energetic proton flux. 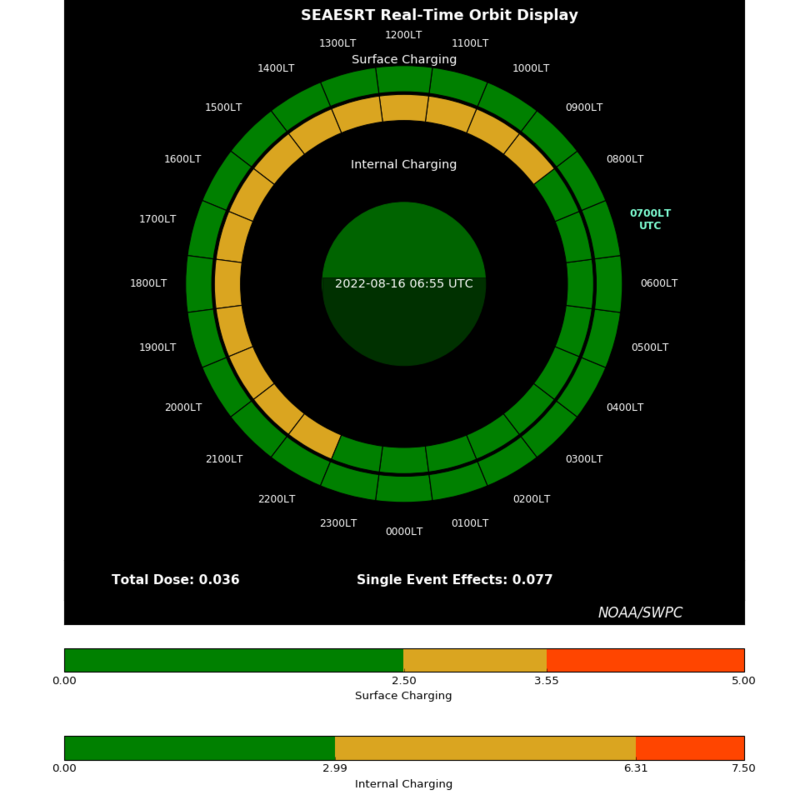 The version of SEAESRT running is the first operational release. 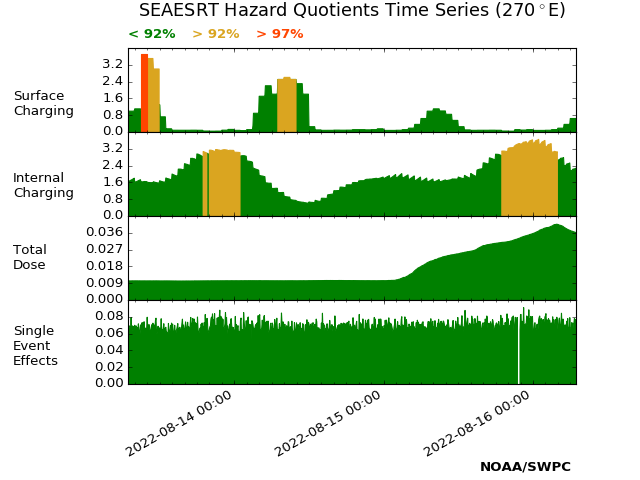 SEAESRT plots may be directly accessed at http://services.swpc.noaa.gov/images/. This location includes three additional longitudes not displayed on the web page. SEAESRT outputs are not currently archived.